Can Payne be excused or is he the A-League’s Henry? Chris Payne channelled Thierry Henry on Saturday night at the Sydney Football Stadium to help ‘hand’ Sydney FC a berth in the A-League grand final, reigniting the debate over the ethics of an intentional handball. 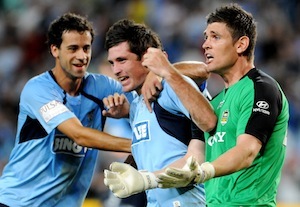 Payne, an early substitute for the injured John Aloisi, reinstated Sydney FC’s lead in the 30th minute with what was a clear handball. Replays confirmed the touch, but without the benefit of such hindsight, the goal stood despite the protests of the Phoenix players, and the pendulum of the game swung back in Sydney’s favour. While Sydney’s 4-2 victory meant Payne’s goal wasn’t the difference between the sides, it undoubtedly helped change the momentum of the game considering it occurred so quickly after Wellington had equalised. Was it as intentional as Henry’s handball? I don’t think so. It seemed the ball bounced off his flailing arm, which was in the natural movement of a player trying to reposition his body to make contact with the ball. Payne’s celebration, however, will disappoint purists the most, especially following Henry’s example of masking his misdemeanour in exuberance. Payne is a young player given an enormous opportunity when Aloisi’s hamstring popped. Undoubtedly inspired by his opening goal of the game, perhaps the occasion and the excitement of his second got the better of him. Considering his age, inexperience and stature, especially when contrasted with Henry, we should go easier on Payne. But the more salient point is that these issues will continue to scar the game without some action from FIFA, be it an extra referee on the goal-line or the more extreme option of video technology. Until that happens, and as referees continue to miss such incidents (which can so easily happen), the burden falls on the players and teams to admit their guilt – something most will not do. The question, therefore, is whether it is right that players, with a responsibility to their teams’, should face this pressure when the burden of responsibility should be with the officials. It’s a lot to expect from players so determined to win at all costs, and as Jason Culina confirmed in the wake of the Henry controversy, most players in that situation would have done the same. But such incidents damage the game’s brand. Thanks to Henry there is increased pressure on players to come clean with such incidents and live up to the game’s “Fair Play” motto. There is a place in football folklore for the player who, in the current climate, defies the trend set by Henry and following such an incident puts their hand up (couldn’t avoid that pun) to the referee and admits their folly or misdemeanour. Perhaps then other players will follow the trend and football can find its ethical core.